Regiment/Catrawd: 10th Squadron Royal Flying Corps. Service Rank and Number / Rheng gwasanaeth a rhif: Second Lieutenant. Military Cemetery/Memorial / Fynwent milwrol: Chocques Military Cemetery, Pas de Calais. Ref No Grave or Memorial / Rhif cyfeirnod bedd: Plot: 1. Row: F. Grave: 31. Shot down and killed whilst on a photographic reconnaissance mission over enemy lines, aged 22 years. John Wathen Eyton-Lloyd was born in Rhyl, Flintshire during 1895. The 1901 Census shows that the family lived at Eytonhurst, East Parade, Rhyl, Flintshire. 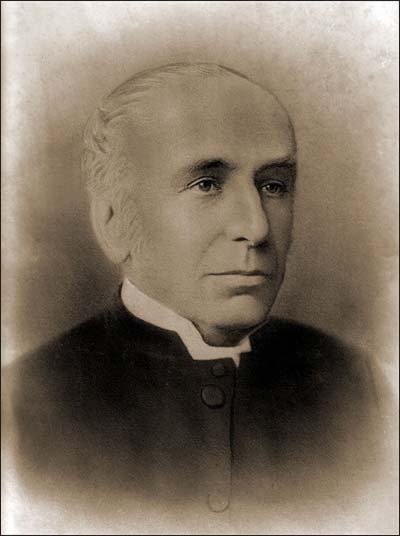 The head of the family was Albert Eyton-Lloyd aged 53, a Doctor of Medicine. His wife Bertha Midwood Wathen-Lloyd aged 46 and their two children – Lily Eyton-Lloyd aged 14 and John Wathen Eyton-Lloyd aged 5 years. Their eldest son George Eyton-Lloyd aged 18 was away from home at College. Also living with the family were three employees of Dr Eyton-Lloyd, namely, Ethel Tall aged 23, a Domestic Governess, Sarah Nichol aged 44, Cook and Gertrude Emma Mynett aged 17, a Domestic Servant. John Wathen Eyton-Lloyd was educated at Colet House School, East Parade, Rhyl and then Epsom College. He was later articled to the Shotton Engineering Company, but when war broke out enlisted at the Recruitment Centre, Rhyl into the Army. He transferred to the Royal Flying Corps and received his commission as a Second Lieutenant. An announcement to this efferct appeared in the London Gazette on Tuesday 29 August 1916. He passed the several stages of his training with distinction and was awarded his ‘Wings’. On Sunday 24 June 1917 whilst on a photographic reconnaissance mission over enemy lines he was shot down and killed. On 27 October 1917, a payment of £76.0s.7d was made by the War Office to his father Dr Albert Eyton-Lloyd, being monies owed to his son John. On 24 January 1920, a War Gratuity payment of £11.0s.0d was also made to him. 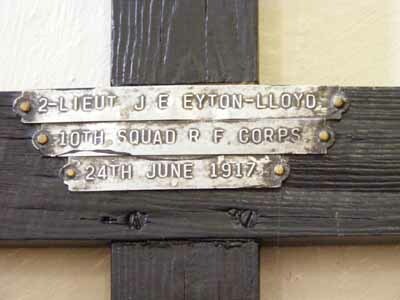 Second Lieutenant John Wathen Eyton-Lloyd is remembered in St. Mary’s Church, Guarlford, Worcestershire. 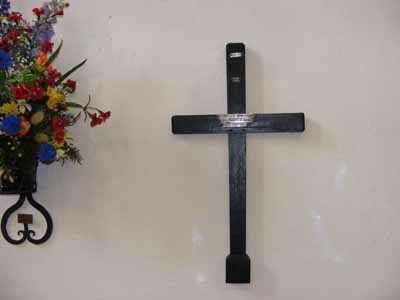 On an inside wall of the church near to the British Legion Standard is a plain wooden cross in memory of him. The basic construction of the cross and the rudimentary metal label recoding his details leads to the assumption that it is the original grave marker. The original grave marker a plain wooden cross. Metal label on the wooden cross. The reason that he is remembered in this church is that he was the grandson of the first Rector, The Reverend John Bateman Wathen. The Reverend John Bateman Wathen. 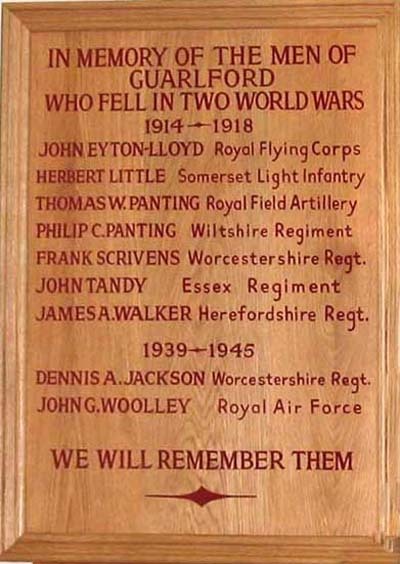 John is also remembered in the Flight Magazine dated 19 July 1917, The Heroes of Colet House Remembrance Plaque and last but certainly not least the Remembrance Plaque in the Royal Alexandra Hospital, Marine Drive, Rhyl. There is no Flintshire Roll of Honour Card for him at the County Archives Office, Hawarden.